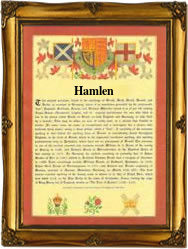 This interesting surname, of English origin, is derived from the Anglo-Norman French given name "Ham(b)lin", a double diminutive of "Hammone", itself coming from the Norman personal name "Hamo(n)", which derives from the Germanic "Haimo", a short form of the various compound name with the first element "haim" meaning "home". The surname is found mainly in the West Country and it dates back to the early 13th Century (see below), while further recordings include one Thomas Hamelin (circa 1230), in "Liver Memorandorum Ecclesie de Bernewelle, Cambridgeshire", and Walter Hamelin (1243), a witness in the Assize Court Rolls of Somerset. Variations in the idiom of the spelling include Hamlin, Hamlen, Hamblyn, Hamlen, and Hambling. Recordings from London Church Registers include the marriage of Marie Hambline and William Prestwood at St. Mildred with St. Coleman Colechurch, on January 31st 1599, and the christening of Hannah, daughter of John and Mary Hamblin, on December 9th 1683, at St. Dunstan's, Stepney. The first recorded spelling of the family name is shown to be that of Richard Hamlyn, which was dated 1219, recorded at Larkbear, Devonshire, during the reign of King Henry 111, known as "The Frenchman", 1216 - 1272. Surnames became necessary when governments introduced personal taxation. In England this was known as Poll Tax. Throughout the centuries, surnames in every country have continued to "develop" often leading to astonishing variants of the original spelling.